The Beloved, Bickering Bridgertons Turn 15 This Year As part of our Time Machine series coverage, NPR romance guru Bobbi Dumas introduces readers to the rosy-hued Regency of Julia Quinn's Bridgerton family books, some of the most popular romances ever. Welcome to the NPR Books Summer of Love! 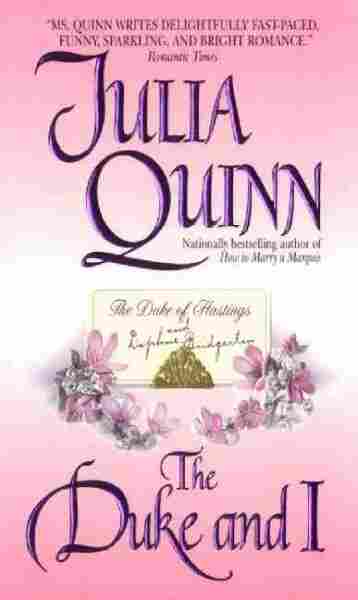 In January, historical romance queen Julia Quinn finished up her latest series, the Smythe-Smith Quartet — and told readers that next, she'd be headed back to her beloved Bridgerton family. Given that all eight Bridgerton siblings already have their own books, I'm not sure how she's going to do it — but I can tell you that those words sent Quinn fans into an ecstatic tizzy of pleasure. The first Bridgerton novel, The Duke and I, came out in 2000, which means this year marks the 15th anniversary of one of the most popular series in modern romance. Quinn has said it was originally meant to be a trilogy — but a constant flow of fan questions meant the story kept expanding. The Bridgertons are a fictional aristocratic family made up of widow Violet and her eight alphabetically named children: Anthony, Benedict, Colin, Daphne ... you get the picture. Their viscount father Edmund died young from an allergic reaction to a bee sting, leaving Violet alone with the children, the oldest 19, the youngest an infant. Those children all find love and pair off throughout the eight books in the series, and while each volume tells a different story, Quinn frequently turns to classic tropes with a clever twist. There is a Cinderella retelling for Benedict, and an anguished second chance at love (with a little dash of friends-to-lovers) for Francesca. Eldest Anthony has decided on a smart and beautiful wife, but finds himself haunted by her plain older sister. Meanwhile Colin comes home from his travels intent on unmasking an irritating gossip columnist, but gets caught up in the intriguing secrets of a girl who has forever been in the background — and is suddenly front-and-center in his imagination. Quinn is known for her witty charm, and it's all on display with the Bridgertons, who balance camaraderie, competitiveness, bickering and banter. These are romances, so the emotional tension of the love story is always the focal point of the book — but Quinn never loses sight of the fierce love the siblings have for each other, their friends and families. She's also a romance master, able to set up realistic obstacles that tug at the heartstrings while keeping the hero and heroine believably apart. With the Bridgertons, Quinn has created a family so likable and attractive, a community so vibrant and engaging, that we want to crawl into the pages and know them. We want to be friends with the women, and of course we're in love with the men — and not just because they're rich, aristocratic and gorgeous, but because they're truly nice, occasionally flawed, completely relatable characters. People we honestly wish we knew. More than that, Quinn dots her imaginative London canvas with an entertaining cast of supporting characters who drift from book to book, serving as comic relief, keen social observers and sometimes, annoying sages. Highly popular pseudonymous gossip columnist Lady Whistledown keeps up a running commentary on London life, and almost every book features a new edition of the unfortunate Smythe-Smith sisters' legendarily dreadful annual musicale. Both Lady Whistledown and the Smythe-Smiths ended up with their own books — and even the conniving, cane-thumping grande dame Lady Danbury has her own happy ending of sorts (after terrifying a generation of Bridgertons). 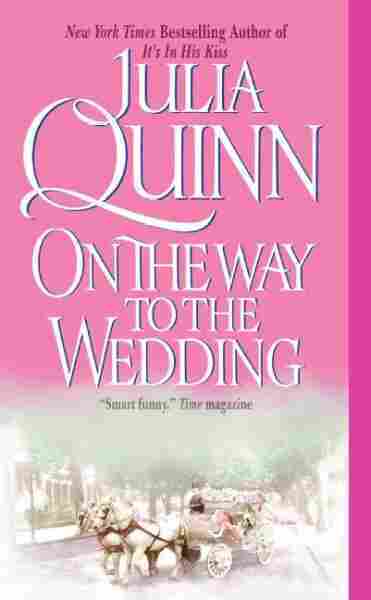 Quinn is considered a gateway romance author, by which I mean fans often recommend her to people who might consider giving romance novels a try. More than one romance convert has told me she was their very first. And I can see why Quinn might be able to convince reluctant readers to keep going, especially if they start with the Bridgertons. Bobbi Dumas is a freelance writer based in Madison, Wis. She writes, blogs and reviews for Kirkus Media, and celebrates romance and women's fiction on her website ReadARomanceMonth.com.